WARNING Do not allow children to play with the seat belts. Most seating positions are equipped with Automatic Locking Retractor (ALR) mode seat belts. If the seat belt becomes wrapped around a child’s neck with the ALR mode activated, the child can be seriously injured or killed if the seat belt retracts and becomes tight. This can occur even if the vehicle is parked. Unbuckle the seat belt to release the child. If the seat belt cannot be unbuckled or is already unbuckled, release the child by cutting the seat belt with a suitable tool (such as a knife or scissors) to release the seat belt. Generally, infants up to about 1 year and less than 9 kg (20 lbs) should be placed in rear-facing child restraints. Forward-facing child restraints are available for children who outgrow rearfacing child restraints and are at least 1 year old. WARNING Infants and children need special protection. All Canadian provinces or territories require the use of approved child restraints for infants and small children. For additional information, refer to “Child restraints” in this section. A child restraint may be secured in the vehicle by using either the LATCH (Lower Anchors and Tethers for CHildren) system or with the vehicle seat belt. For additional information, refer to “Child restraints” in this section. For additional information, refer to “Supplemental Restraint System (SRS)” in this section. Infants up to at least 1 year old should be placed in a rear-facing child restraint. NISSAN recommends that infants be placed in child restraints that comply with Canadian Motor Vehicle Safety Standards. You should choose a child restraint that fits your vehicle and always follow the manufacturer’s instructions for installation and use. Children that are over 1 year old and weigh at least 9 kg (20 lbs) should remain in a rear-facing child restraint as long as possible up to the height or weight limit of the child restraint. Children who outgrow the height or weight limit of the rearfacing child restraint and are at least 1 year old should be secured in a forward-facing child restraint with a harness. Refer to the manufacturer’s instructions for minimum and maximum weight and height recommendations. NISSAN recommends that small children be placed in child restraints that comply with Canadian Motor Vehicle Safety Standards. You should choose a child restraint that fits your vehicle and always follow the manufacturer’s instructions for installation and use. Children should remain in a forward-facing child restraint with a harness until they reach the maximum height or weight limit allowed by the child restraint manufacturer. Once a child outgrows the height or weight limit of the harness-equipped forward-facing child restraint, NISSAN recommends that the child be placed in a commercially available booster seat to obtain proper seat belt fit. For a seat belt to fit properly, the booster seat should raise the child so that the shoulder belt is properly positioned across the chest and the top, middle portion of the shoulder. The shoulder belt should not cross the neck or face and should not fall off the shoulder. The lap belt should lie snugly across the lower hips or upper thighs, not the abdomen. A booster seat can only be used in seating positions that have a three-point type seat belt. The booster seat should fit the vehicle seat and have a label certifying that it complies with Canadian Motor Vehicle Safety Standards. Are the child’s back and hips against the vehicle seatback? Is the child able to sit without slouching? Do the child’s knees bend easily over the front edge of the seat with feet flat on the floor? Can the child safely wear the seat belt (lap belt low and snug across the hips and shoulder belt across mid-chest and shoulder)? 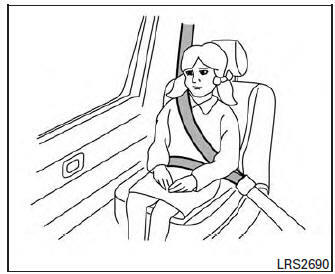 Is the child able to use the properly adjusted head restraint/headrest? Will the child be able to stay in position for the entire ride? If you answered no to any of these questions, the child should remain in a booster seat using a three-point type seat belt. NOTE: Laws in some communities may follow different guidelines. Check local and state regulations to confirm your child is using the correct restraint system before traveling. WARNING Never let a child stand or kneel on any seat and do not allow a child in the cargo area. The child could be seriously injured or killed in a sudden stop or collision.